New York has easily become my home away home. I’m there a lot for work and feel so blessed to have gotten know the Big Apple so well over the years, including some must-stop spots. Sometimes I only have a few short hours in the city, so I’ve compiled a list of the things I’d do if I had 24 hours in NYC. Keep in mind that I don’t always get to do these, but this is my ideal day! This super popular gem is an absolute must for breakfast in New York. With several locations across the city, Jack’s Wife Freda serves classic entrees with a hint of Mediterranean flare. You can get everything from fresh waffles to egg platters to frittatas. Of course I can’t forget that they have great sides like yogurt, granola and delicious fruits. I also really love Nickel and Diner, its a short walk from the 11 Howard where I usually stay and they make the best eggs. Pietro is literally Instagram heaven, but it’s also extremely delicious. This bite-sized NoLita restaurant is drowned in all-pink décor and has grown to immense popularity over the last year. You can grab a healthy Italian lunch here ranging from sandwiches to salads to fresh handmade pastas. Just a head’s up, there are no reservations for Pietro so seating is first-come first-serve. It is also a cash-only spot, so be sure to stop by an ATM beforehand! If you can’t make it here, Jack’s Wife Freda is also a great lunch spot. Cha Cha Matcha is located in the heart of lower Manhattan, and no it doesn’t only serve matcha teas. You can snag a delicious coffee and select a pastry or dessert from their various options. At the moment, they have this great soft serve ice cream on the menu for a limited time. The NoMad location also just started serving açaí bowls! I had seen this cute little spot all over my Instagram feed lately so I just knew I had to try it. While We Were Young is the ultimate spot for a dinner with your girl friends in NYC. The West Village eatery is almost too pretty for words and of course you’ll have to snap some pics. It has a great drink menu and food options consisting of salad, great seafood and vegetarian options. While We Were Young is only open for dinner during the week, but is also open for brunch on the weekends. Other places I love for dinner are Bondst and Carbone. I was going to leave this to one must-stop beauty spot, but I had to share two with you! Did you guys know that the biggest Sephora in the country is located in NYC? You can find it on 34th Street with nearly 14,000 products in stock—I know, amazing. 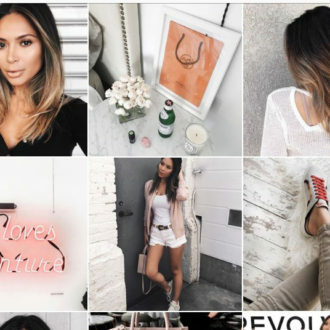 This location also has a Beauty Board where you can shop from a gallery of consumers Instagram posts and more. My second beauty stop is Paintbox Nails, because it seems like everyone always goes there. The cute SoHo nail salon features both gel and regular manicures from a range of specially curated designs from its artists. They also have a photo booth onsite to help capture the perfect shot of your fresh mani once you’re done! I like this post because I like fashion. I thoroughly enjoyed this read. Would there be a small opening for a site to see? A park or something? I’d love one of these for the LA area. Lovely post for 24 hours in the greatest city! Lovely way to spend 24 hours in the greatest city!